Big data is revolutionizing many fields of business, and logistics analytics is one of them. The complex and dynamic nature of logistics, along with the reliance on many moving parts that can create bottlenecks at any point in the supply chain, make logistics a perfect use case for big data. For example, big data logistics can be used to optimize routing, to streamline factory functions, and to give transparency to the entire supply chain, for the benefit of both logistics and shipping companies alike. Third party logistics companies and shipping companies both agree. Paraphrasing a Fleetowner article that examined the “21st Annual Third Party Logistics Study”, 98% of 3PLs said that improved data-driven decision making is “essential to the future success of supply chain activities and processes”. Additionally, 81% of shippers and 86% of 3PLs surveyed said that using big data effectively will become “a core competency of their supply chain organizations”. So clearly, there are many ways that data systems can be fed the information they need. All of these data sources and potential use cases have lead DHL to say that big data and automation technology will lead to “previously unimaginable levels of optimization in manufacturing, logistics, warehousing and last mile delivery”. As for many other industries, data gathering and data management is becoming bigger and bigger, and professionals may need help in that matter. The rise of SaaS business intelligence tools is answering that need, and Gartner predicted in a report that in 2017, most business users will have access to self-service BI. A big factor in this deviation from ‘IT-centric BI’ is that requiring people to rely completely on IT to access business intelligence does not make sense anymore. The logistics industry is also very likely to embrace that trend. In any case, it looks like the future is bright for logistics companies that are willing to take advantage of big data. In this article, we’re going to examine big data examples in logistics and some benefits to fuel your imagination and get you thinking outside of the box. …and learn how big data can transform and benefit the logistics industry! It can be challenging for large delivery trucks to park near their destination in urban areas. Drivers often have to park quite a while away, and then walk the package to its final address. Then, they may have to go up many flights of stairs or wait for an elevator in a high rise building. Some items must be signed for, and if a customer isn’t home, the item can’t be delivered. Delivery personnel have to take extra care not to damage the package during this last leg, and they must give present themselves in a professional way to the recipient. Adding to these challenges, it can be very difficult to know exactly what’s going on during the last leg of delivery. Packages are often tracked up until this point, leading some to say that the last mile is the “black box” of delivery data. Big data aims to address many of these challenges. 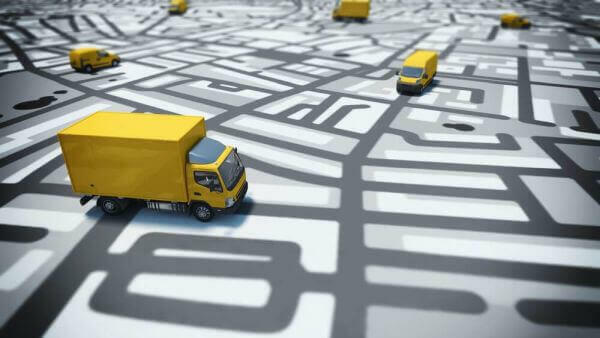 In an interview with the Wall Street Journal, Matthias Winkenbach, director of MIT’s Megacity Logistics Lab, details how last mile analytics are yielding useful data. Because of the low cost and ubiquity of fast mobile internet and GPS enabled smartphones, as well as the spread of the Internet of Things through sensors and scanners, shippers are able to see how the delivery process goes from start to finish – even during the last mile. As sensors become more prevalent in transportation vehicles, shipping, and throughout the supply chain, they can provide data enabling greater transparency than has ever been possible. This transparency is valuable to shippers, carriers, and customers. If a shipment is going to be late, carriers want to know as soon as possible so that they can prevent bottlenecks further down the supply chain. And carrier companies can use this data in the aggregate to negotiate with shippers by showing how often they deliver on time. Imagine this: logistics companies have embedded sensors in all of their delivery vehicles, with GPS enabled smartphones covering any gaps. A third party validates these sensors for accuracy, and then the reliability and timeliness data from these sensors is used when logistics companies are bidding for new contracts. This kind of open source, radically transparent information could change how business is conducted in the logistics world. In the 3PL survey cited at the beginning of this post, 70% of respondents stated that “improving logistics optimization” was the best use of big data in logistics. Clearly, optimization is on everyone’s mind. Why are logistics companies so interested in optimization? For two reasons: it helps them save money and avoid late shipments. When you’re managing a delivery system or supply chain, you have to walk a fine line between overcommitting resources and vehicles and undercommitting them. If you put too many vehicles and resources on one delivery route, then you are spending more money than you have to, and possibly using assets that could be better utilized elsewhere. However, if you underestimate how many vehicles a particular route or delivery will require, then you run the risk of giving customers a late shipment, which negatively affects your client relationships and brand image. Big data and predictive analytics gives logistics companies the extra edge they need to overcome these obstacles. Sensors on delivery trucks, weather data, road maintenance data, fleet maintenance schedules, real time fleet status indicators, and personnel schedules can all be integrated into a system that looks at the past historical trends and gives advice accordingly. UPS is a real-world example of big data logistics leading to big savings. After examining their data, UPS found that trucks turning left was costing them a lot of money. In other words, UPS found that turning into oncoming traffic was causing a lot of delays, wasted fuel, and safety risk. As a post from The Conversation titled “Why UPS drivers don’t turn left and you probably shouldn’t either” states, UPS “claims it uses 10m gallons less fuel, emits 20,000 tonnes less carbon dioxide and delivers 350,000 more packages every year” (after making the change). 10 million gallons of gas is a lot of money – that’s some serious benefit and a big data example in supply chain. UPS drivers now only turn left about 10% of the time, opting to go straight or turn right instead. Due to this “left turns only when absolutely necessary” strategy, UPS has also reduced the number of trucks it uses by 1,110 and reduced the company fleet’s total distance traveled by 28.5 million miles. Keeping perishables fresh has been a constant challenge for logistics companies. However, big data and the Internet of Things could give delivery drivers and managers a much better idea of how they can prevent costs due to perished goods. For example, let’s say a truck is transporting a shipment of ice cream and desserts. You could install a temperature sensor inside the truck to monitor the state of the goods inside, and give this data along with traffic and roadwork data to a central routing computer. This computer could then alert the driver if the originally chosen route would result in the ice cream melting, and suggest alternate routes instead. Soon enough, big data combined with automation technology and the Internet of Things may make logistics an entirely automated operation. Big data allows automated systems to function through intelligently routing many different data sets and data streams. For example, Amazon already has automation present in their fulfillment centers, which use little orange KIVA robots to grab items from shelves. Additionally, Amazon has automated drones that can deliver items to you if you live within 30 minutes of an Amazon center. Seeing as how Uber and other companies are already doing test runs of self-driving vehicles, it’s not hard to imagine that a whole supply chain could be automated, from loading and unloading, to driving, to final delivery. Perhaps humans would still be involved in the last mile of delivery in urban areas, using bikes or scooters to navigate busy city streets and give deliveries a reassuring human component, and suburban areas would have self driving trucks or drones for delivery. We’re on the cusp of big data transforming the nature of logistics. Big data in logistics can be used to reduce inefficiencies in last mile delivery, provide transparency to the supply chain, optimize deliveries, protect perishable goods, and automate the entire supply chain. Logistics companies are aware of these possibilities, and are striving to make more data-driven decisions moving forward. Using sensors and the Internet of Things, combined with business intelligence software, forward thinking companies are already reducing costs and increasing customer satisfaction.